March Madness brings us another GHP transition. TAC is pleased to present you with the 3rd installment. This time, courtesy of Alfred Walker. "Superman" is based on the original character appearing in Superman magazine. These are the closing words of each episode of the Adventures of Superman. During those times, the comic books promoted the television series, and in turn the series did the same for the comic books. National Periodicals worked to make sure their television viewers knew Superman could be found at your local newsstand. 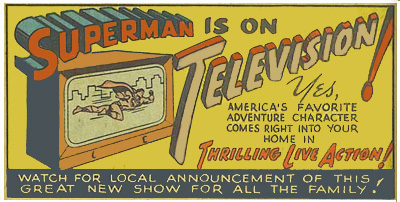 The comic book included ads for the television series (see image below). At times, actual comic books were present in the episodes. For a well-detailed account of these episodes be sure to visit Richard Potter's George Reeves Forever. Richard did a marvelous job capturing the images with the comic book issues. It's probably safe to say National's advertising costs were down to a minimum, and the monetary benefit was a bonanza. While the TV show and the comic books complemented each other, viewers and readers may not have cared about the many differences from one to the other. Yes, the basic character is all there: Krypton, Smallville, Metropolis, the costume. Differences included Clark Kent's adoptive parents in the comic books going by the name of Jonathan and Martha Kent and as Eben and Sarah Kent on television. In the comic books, there is Krypto the dog, Mister Mxyzptlk, Bizarro, a Super horse, a Super cat, a Supergirl along with other survivors from the planet Krypton. In the TV series you won't find super animals, super survivors, Lex Luthor, Lana Lang, the Fortress of Solitude and no ties to a certain caped crusader and his ward. Superman on television is a completely unique entity, with the exception of a little fellow named Mr. Zero from the planet Mars. Otherwise he stands alone saving the day for the good against criminals and evildoers alike. In my view, the series was treated more maturely in comparison to the comic books. You might read "Up, up and away" in the comic books, but you won't hear it in the series. A lot falls back on the tight budget and the high expense for special effects for filmmaking, not to mention the limited technical capabilities. Drawing Lex Luthor and all his gadgets is going to cost far less than the investment to make him an equal adversary for TV's Superman. Let Lex Luthor function any less and the viewers undoubtedly will recognize the differences and be disappointed. Therefore, the simple solution is to not include him. Fans of the show unofficially have likened John Eldredge in any and all of his villainous appearances to be as near to Lex Luthor as the producers would allow. The true advantage with comic books is the imagination is limitless. Writers and illustrators can take the reader to whole new worlds. Today, with CGI, films have reached that epitome. It's obvious when reading Basement that Alfred reaches out to connect the parallels between the TV and comic book worlds, without losing the focus that they are separate in many ways. Depending on personal preference, one becomes the prime, the other becomes a sort of Earth Two version. Since the comic book came first, thanks to creators Jerry Siegel and Joe Shuster, it seems only right to define the comics as Earth One. Alfred's personal recollection of his affection for Superman comes primarily during the 1950's Adventures of Superman when comic books were ten-cents to the early Sixties when the price increased by two cents. With the exception of two lives tragically cut short - George Reeves and, soon to follow, President John F, Kennedy - it was a magical time. George Reeves as Superman was a household name in the minds of youngsters. The Superman artists for DC Comics are Wayne Boring and Curt Swan. Mr. Swan, by his own admission illustrated Superman with George as his inspiration. The Adventures Continue (TAC) is a website devoted to George Reeves and the Adventures of Superman. All contents copyright© by Jim Nolt unless otherwise noted. All rights reserved. Nothing from this website may be reproduced by any means, in whole or in part (excpet for brief passaged used solely for review purposes) without the written permission of either Jim Nolt (owner) and/or Lou Koza (editor). The items contained in the feature pages titled Alfred Walker's Basement by Alfred Walker is the copyright and ownership of Alfred Walker and cannot be reproduced by any means, in whole or in part without Mr. Walker's written permission.